We hear it all the time: “If it’s not broken. Don’t fix it.” That said, you and I know that it pays to upgrade because new technology typically makes things work better, faster and more efficiently. The same is true of processes at your business. With technology changing so quickly, without taking the step to transform your operations, you can lose your competitive edge. Your competitors can leap frog over you and get the advantage because they have already made the commitment to automate their operations. Improved agility and flexibility, greater knowledge sharing within and between teams, and improved customer service are the biggest benefits resulting from document and process initiatives. Faster end-to-end response and increased visibility come ahead of reduced costs and improved compliance. We also hear about the challenges to transform. Department staffers are in tune with pain points, especially with processing paper in accounts payable. Searching for data in file cabinets or PDF files in Human Resources, results in spending an inordinate amount of time re-keying information, when processing claims. It is a tedious process and a time-waster if these reflect repetitive tasks that plague your operations every day. Intelligent Information Management (IIM), also known as Content Management, addresses multiple pain points and challenges faced by businesses today. 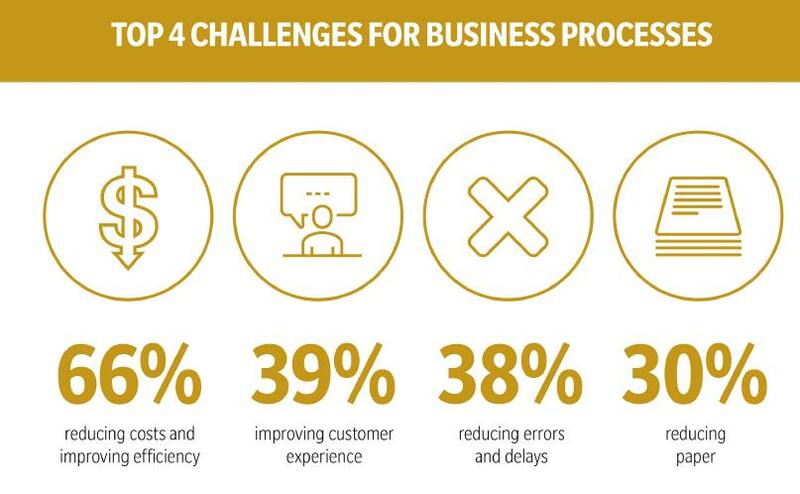 As a benchmarking study noted, customers surveyed were able to identify their top challenges and the key benefits they believe IIM has brought to their organization. They also identified the current state of their operating environment, which shows that many survey respondents have a long way to go before they can fully achieve their digital transformation. Ugh. Think of all things you have done at home to simplify your life, from remotely adjusting your thermostat to storing/accessing photos in the cloud. Then, you come to work and you are still routing paper folders for signatures, and paying for physical file storage that could be wiped out by the next hurricane. It’s time to transform your business operations to be automated, your paper records into digital files and your data into a secure format. The objective is to limit your risk and ensure your business’s continuity, whatever natural or human disasters you encounter. So, where do you start? While your line-of-business staff have raised their hand high to get the paper out and digital assets in for centralized storage, easy search and retrieval, and more automated processes, senior management is not always on-board. The key is to understand that content management systems not only provide a better way to operate, but also a smarter way. The list is long, and you may have challenges that are unique to your operations that content management can streamline and help you become more efficient. Often, the best first step is an Information Process & Analysis assessment to define your problems, and see the road map to the solutions’ deployment. You learn. We learn. And, together we build a road map. You can ask ROI questions, you gain an understanding of our phased approach, and you can see across the entire content management spectrum –new insights that will likely solve your business needs. One-third of document and processing initiatives repay the investment in 12 months or less, and two-thirds within two years. Recognizing that you need to transform is important, but taking that first step toward transformation is critical. Many firms are just slow to start, and have not considered the value of a digital strategy, but through an assessment, you can build the best roadmap that supports your strategic goals. Available through OMNIA Partners, Konica Minolta offers members an expansive product portfolio of Management Print Services, Content Management Solutions, IT Services and Marketing Services. Contact Us for more information.